The irruption of Snowy Owls gets better and better. New reports come in daily from Minnesota, Wisconsin, and the Dakotas. Owls are spread from far nothern Minnesota to the Iowa border. Two have been reported from the Twin Cities, the most recent an owl seen yesterday at the Minneapolis-St. Paul International Airport. That is not a good owl to go look for. Airport police don't appreciate casual visitors driving around in the guts of the place, which is what one must do to check thoroughly. Plus, the airport has concern about birds and airplanes, so has hired people to trap owls and relocate them elsewhere. 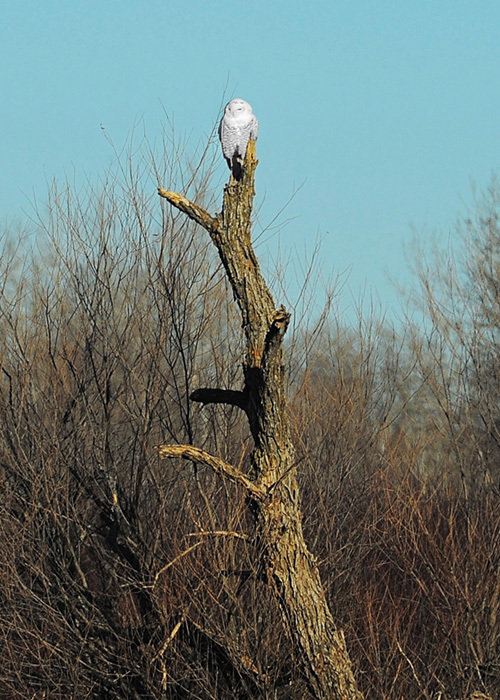 The owl shown below was photographed two days ago in Morrison County near Royalton. I found it with help (precise directions) from a local birder. The owl, white in a brown landscape, was like a beacon once seen. The bird was about 100 yards off the road on private property, so the photo could be better. If I had been able to enter the land, I wouldn't have gotten much closer anyway, fearing flushing the bird. You never ever want to be the one who turns a found bird into one that flies to an unknown place.